The American Homebrewers Association (AHA) has been an advocate of homebrewers rights since 1978 and has over 43,000 members nationwide. The AHA is a division of the Brewers Association, which strives to protect and promote professional and amateur craft brewers alike. Every year since their inception, the AHA has hosted the National Homebrewers Conference (NHC) which aims to be a fun and educational event for amateur brewers of all skill sets. This is the place to sharpen one’s skills and to meet with other people who are passionate about the craft of homebrewing. An equally important aspect of the NHC is the final judging and award ceremony for the National Homebrew Competition. Many of the conference attendees have entered beers in the competition and were eager to learn of the results of the world’s largest beer competition. I am fortunate enough to have an incredibly supportive wife who agreed that I needed to attend the 37th Annual NHC, which was held at the Town and Country Resort in San Diego, June 11-13. A great friend of mine, my partner in conference, and I booked hotel accommodations near the conference and made our way to sunny San Diego the day prior to the event. On that sunny note, it was drizzling and cloudy when we arrived and continued to be through most of the little time that we spent outdoors. On the bright side, we spent much of our time in seminars and at the Homebrew Expo and Social Club. After checking in to our hotel and then the conference, we made our way to Ballast Point in Little Italy for some grub and a pint or two; then it was back to the hotel to rest up for the first day of the NHC. Day one: A palm tree lined freeway separated us from most direct route to the conference and therefore a stroll past hotel after hotel after hotel was necessary. The walk from our hotel to the conference was fueled by a hearty breakfast. The hearty breakfast was a necessary buffer due to the anticipation of the consumption of a lot of a little bit of beer. I say “a lot of a little bit of beer", because this is not a beer drinking event, but a sampling event. We sampled 4 ounces at a time and quickly lost count, but we made sure to stay hydrated with plenty of water. The intake of so much liquid led to a phenomenon often found at male prevalent events, the “bathroom line role reversal”. Not once did I go to the bathroom without waiting in line and not once did I see a line for a woman’s restroom. 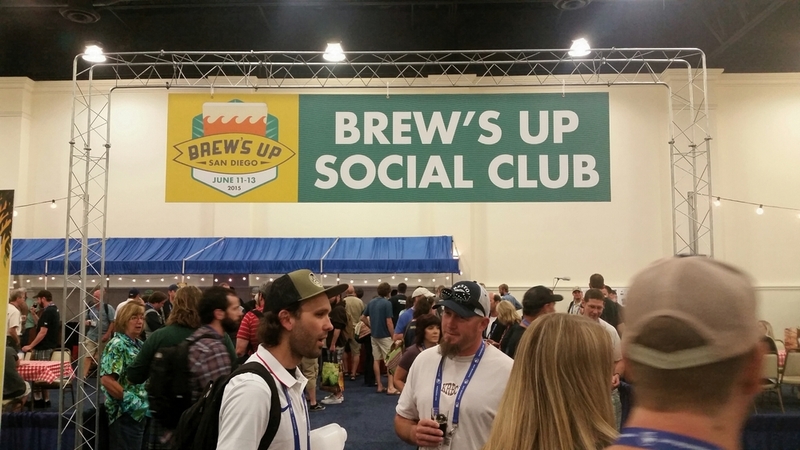 The first thing on our schedule was to hit up the Homebrew Expo and Social club. Walking through the doors we were greeted by booth after booth of brewing equipment and ingredient exhibitors. As I strolled by the exhibitors, I would ooh at one then ah at the next. There were too many booths for me to discuss in detail, but I will share a few of my highlights. Wil Wheaton (Wil. Freaking. WHEATON!) was at the Northern Brewer booth greeting fans and sampling some of his Northern Brewer recipe kit beer, VandalEyes PA. I did not stand around long enough to meet the man, but I did sample some of the tasty brew and had absolutely no desire at all to say, “Shut up Wesley”; but seriously, it was a darn good IPA that Wil and Northern Brewer can and should be proud of. The 2013 Hombrewer of the Year, Annie Johnson, has partnered with Picobrew and was brewing a batch on the Picobrew system. Picobrew was also demonstrating another of their products called KegSmarts. This is not your everyday kegerator. Check out the KickStarter page for more info. I had been on the fence about buying a well-known piece of brew software called BeerSmith, but that changed when I got to meet the creator of said software, Brad Smith. My partner in conference was standing at the BeerSmith booth talking with someone that I did not at first recognize and lo and behold, it was Brad Smith. I ended up buying my BeerSmith from Brad Smith (I should have had him sign it). When it came to brews being poured, the Homebrew Expo and Social Club was split in half, with a very obvious line between the homebrew side and the commercial side. The commercial side had Stone, Ballast Point, Green Flash, Coronado, Bells and Samuel Adams to name a few. Walking through the homebrew side led one to the Social Club, which was where the homebrew was pouring. Long communal tables, covered with checkered table clothes, set the scene for many conversations with other homebrewers. There were three stations, each pouring a minimum of ten homebrews. The homebrew clubs that were represented changed daily. I sampled more than I can remember. However, there was one brew that made me take note; a Mango IIPA brewed by Jeremy Voeltz of the Arizona Society of Homebrewers. It was not until I got home that I learned that this brewer had won last year’s Ninkasi award for the most awards won in the National Homebrew Competition. The Mango IIPA had aroma reminiscent of opening a bag of gummy worms. Fruity sweetness dominated and was set against a supportive malt character. This was one of the few homebrews that I felt the need to have seconds of. Excellent work Jeremy Voeltz! Seminar: (Almost) Everything You Know About Beer History is Wrong – Randy Mosher. Mosher literally has books worth of knowledge to share and has been writing about brewing and beer since 1989. I thought that I had a decent understanding of beer history, but what I really had was a decent understanding of beer myths. People are story tellers and in a vacuum of knowledge, they will make things up. For example, the IPA myth states that the English made highly hopped beer to send to India with high amounts of hops intended to help preserve the beer. In reality, the beer that was being sent was a big barley wine like amber ale that would be aged for two years or more and was popular in England prior to ever being shipped to India. While it was massively hopped, most of that hop character that we love today would have faded in the aged October Beer as it was originally called. Other beers, such as Porters and Stouts, were also being shipped to India. The seminar was an hour long, but went by in what seemed like minutes. I was very intrigued by all that Mosher had to say, and will be purchasing a copy of his book, Mastering Homebrew; I look forward to learning more from Randy Mosher. After the first seminar, we felt it was necessary to make our way back to the expo. There was still so much to see and sample. When we walked back into the expo, I saw a homebrew hero of mine, John Palmer. Mr. Palmer wrote the book, How to Brew, which helped me on my way to become a confident homebrewer. I got his attention and attempted to form a few sentences and found myself entering fan boy mode and geeking out. I took a breath and explained that his book helped me find my way in the world of homebrew and honestly changed my life. I also told him that I had promised myself that if I ever had the opportunity I’d hug him, he obliged and I got to check something off of my bucket list. The big event of the first night was the Keynote and Welcome Toast by Tomme Arthur of Lost Abbey. Tomme had so much to say and much of it struck a chord with me, but what really resonated was, “I am nothing without homebrew and I found my everything because of homebrew”. I can be a bit emotional at times, but I did not expect to be moved to tears at the keynote speech of a homebrew conference. I guess that my passion for this craft runs deeper in me than even I knew. Cheers Tomme! Next on the agenda was the Welcome Reception, where 50 breweries were pouring 4 ounces at a time and not a drop more. Many of the lines were long, but none as long as the line for Russian River. My first assumption was that they were pouring Pliny the Younger and that this may be my opportunity to finally try it. Alas, no Younger was to be found and my partner in conference and I chose to imbibe in shorter lines. Many beers were sampled, maybe too many. We made it back to the hotel sometime after midnight and crashed. Day two: We got a bit of a late start, but were fortified by another hearty breakfast and a couple cups of coffee. A shower and then a shared bottle of Ron Mexico helped to set us straight. The bottle was one of six commemorative beers made for the NHC. Each conference attendee was given two bottles. Ron Mexico was a session IPA brewed by Russian River using a hop of the same name and was quite refreshing and light enough to enjoy before noon. While sampling a few pre-seminar refreshments in the Social Club, I ran into one of the nicest people that I have met in the beer industry, Liz Zainasheff (co-founder of Heretic Brewing). Somehow one of Heretic’s kegs went missing the night before and she was hunting it down. I hope that you found that keg and made it home safe Liz. Seminar: A Contrast and Comparison of the Many Variations of IPA – Mitch Steele. Steele is the brewmaster of Stone Brewing Company and knows a thing or two about IPAs. In fact, he wrote a book about them titled, IPA: Brewing Techniques, Recipes and the Evolution of India Pale Ale. This seminar covered the history, characteristics and the many variations of IPA. The first IPA heyday was in the 1800’s in Burton on Trent. IPAs of that era would have been aged upwards of one year in oak that likely contained Brettanomyces. In my opinion, some of the best IPAs that I have had in our current IPA heyday have been brewed with Brett. It is interesting to me just how much the past influences the future. I’m sure that most who are reading this are at least somewhat familiar with the characteristics of modern IPA, so I will not go into further detail on that subject. For more information, maybe pick up a copy of Mitch’s book. I plan to. Seminar: Hands-On Activities to Help You Master Beer Styles - Ray Daniels. Daniels is the author of, Designing Great Beers, which I have not yet read (emphasis on yet). Being a BJCP judge, I thought that this would be a great learning experience and I was correct. Though what I learned was that I had already adopted the lifestyle that it takes to master beer styles. One must be curious about beer, check. One must research, not just beer but the ingredients, check. One must play with said ingredients (i.e. brew a batch or few dozen), check. One must exercise your palate by tasting many different beer styles, check. One must think while you drink and think while you brew, check and check. Mastering Beer styles is a continual process and a very enjoyable lifestyle though it can be costly. My partner in conference and I took another couple laps around the expo and noticed that people were surprisingly sober for the amount of beer being poured. These are professionals, and professionals know their limits. After a second day of beer sampling and seminars, we were reaching our limit and were in need of some rest. With Club Night starting in just a few hours, a hearty meal and a short nap were in order; back to the hotel. Club Night was similar to the Welcome Reception, but with homebrew and creatively decorated and themed club booths. Many brews were sampled and many booths visited, too many to list but I will share a few of my highlights. Sacramento natives, East Sac Brewers, whose booth and costume were reminiscent of a diner was a booth that stands out in my memory. They were pouring waffle and chicken beers. I’m sure that your response to a chicken beer was similar to mine, but I had to try it. It reminded me of a Chicken In A Biskit cracker. The waffle beer was actually delicious and loaded with vanilla, maple syrup and malt characteristics. Another highlight was not actually a booth, but a couple of people dressed as Ghostbusters and the Stay Puft Marshmallow Man. 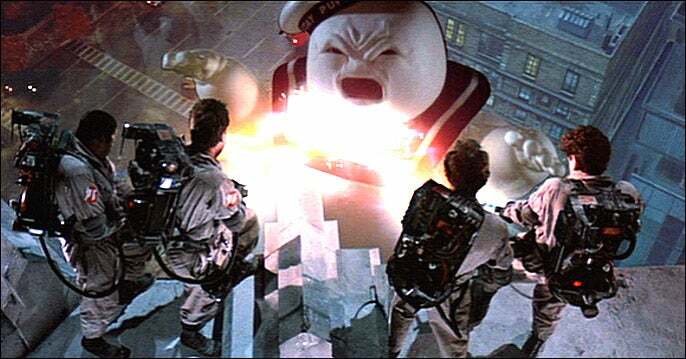 One of the Ghostbusters had a keg full of homebrew strapped to his back, a tasty Russian Imperial Stout if memory serves me, and the other had a brew fest necessity, water; Stay Puft was there to complete the theme. Of all of the great homebrews that I tried, I was most impressed by a few meads that I sampled. I am kicking myself as I type for not taking note of the person, or at least the club responsible. I have had a few great meads before, but was seriously blown away by those nectars. Cheers to whoever it was that brought great mead to Club Night. Day three: A little less beer last night and more water than the night before made for an easier start to the day. Another hearty breakfast and healthy dosing of caffeine fueled my partner in conference and I for another day of beer sampling and seminars. We took another couple of laps of the expo and had more samples of course. This time I attempted to avoid the bathroom line by going before the next seminar, but the ever present line really was ever present. Seminar: Malt - John Mallet. Mallet is the author of Malt: A Practical Guide from Field to Brewhouse and is the Director of Operations at Bell’s Brewery, Inc.. It is said that malt is the soul of beer, but in today’s hop crazed beer market malt is often overlooked; though without malt beer would not exist. In fact, it is believed that we owe our civilization to the cultivation and malting of grains for the use of brewing beer. Malt is a term that brewers use for grain that has been malted. The malting process of a grain is to soak it, which starts the germination. After germination has reached a certain point the grain is kilned, or dried with head, to a desired level of toast or roast. The darker the malt, the more roasted the flavor. It is a little more complicated than that, but I won’t get into the science due to my limited understanding. The book worth of information written by John Mallet is certainly on my to-buy list. The culmination of the NHC was the Grand Banquet and Awards Ceremony. 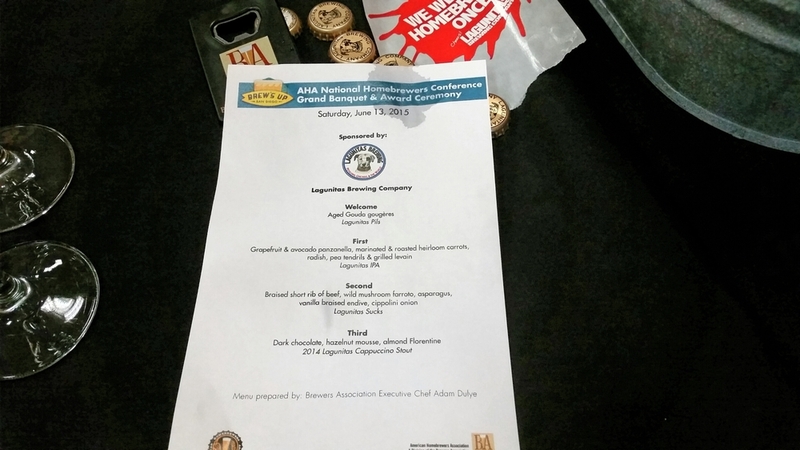 The banquet menu and beer pairings were created by Brewers Association Executive Chef, Adam Dulye. Beers from Lagunitas Brewing graced the table with Chef Adam Duyle’s delicious dishes. The award ceremony took place after our last course was cleared. There were a total of 28 gold, silver and bronze categories awarded in addition to the six special awards given at the ceremony. The complete list can be found here. Clearly there are too many to mention, but I do want to congratulate a couple of Sacramento natives, John Boyd for his gold medal in category 7 and Joseph Cruz for his bronze medal in category 19. Also, I want to give a shout out to all of the Greenbelt Brewers Association members that made their way to the conference, you guys are an example to all of the Sacramento area homebrew clubs. Cheers! I had a fantastic few days at the NHC; it was a pleasure to meet so many people passionate about beer. You can count on seeing me the next time that the NHC is held anywhere near the West Coast. I’d like to thank all of the sponsors that helped make this event happen. I’d also like to say cheers to all of the homebrewers who brought their goods to share with the thirsty crowds. Additionally, I want to thank my partner in conference for taking the trip with me and most importantly a huge THANK YOU to the AHA for putting on such a great event and for supporting your family of homebrewers for 37 plus years.